Wow, how time has flown. We have reached the last Saturday in October. With it, brings a new color challenge at Dynamic Duos. This posting is bittersweet....sadly it is the last posting for the current design team...yet I am so excited to see the new design team coming on next week. Please be sure and join us this week for our monochromatic color challenge featuring More Mustard and so Saffron. I chose Goldrush and Buttercup from Close to My Heart with brown and colonial white as my neutrals. 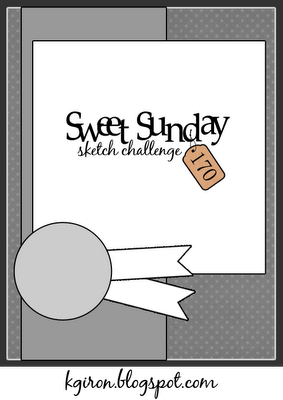 My card is based on the sketch challenge this week at Sweet Sunday. My leaf is stamped in Rich Cocoa Ink by Memento onto watercolor paper. I then colored my image with watercolor pencils and blending with a waterbrush. After my image dried, I turn my image over and ran a stylus over the leaf image. In person, my leaf image is popped slightly off the card by the dry embossing. It adds just a slight bit of dimension to the card. 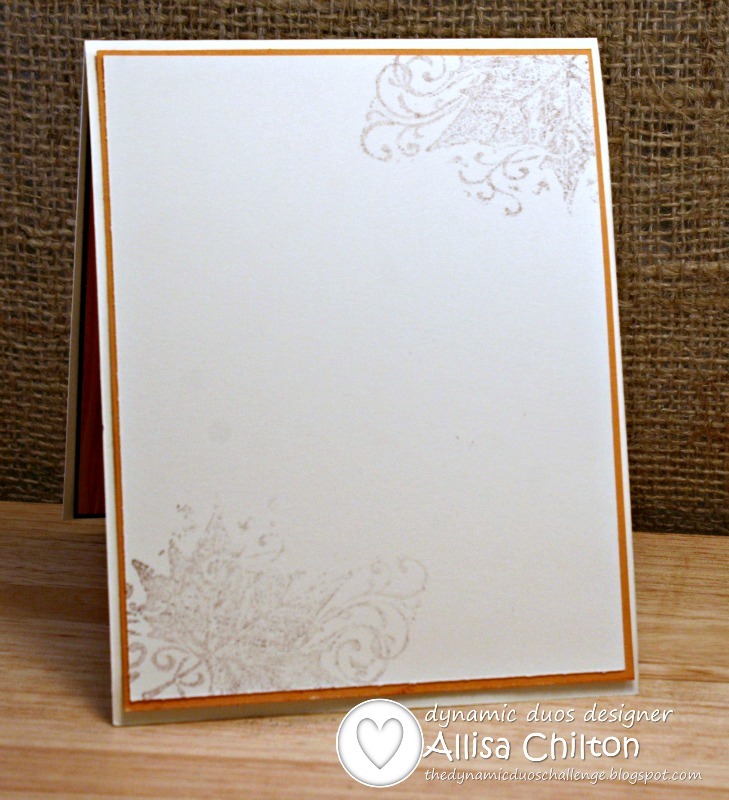 I achived my woodgrain background, by inking up my woodgrain embossing folder with goldrush ink and then embossing onto goldrush cardstock. This gives you a slight tone on tone look. 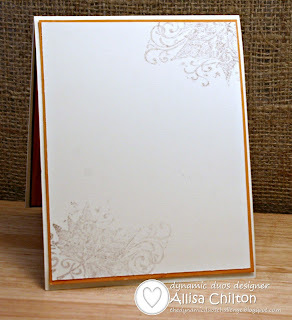 It adds so much more to your card than simply dry embossing. I stamped the same leaf image onto the inside of the card in second generation ink, masking off the sentiment. Beautiful card! and excellent job hi-lighting all the lovely details of your card. 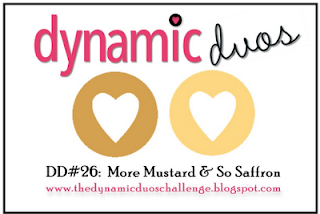 Thanks for the link to Dynamic Duos--I may give it a try this week, time permitting. This is a bittersweet week indeed! Thank you so much for your hard work, gorgeous cards and lovely comments! What's a beautiful leaf Allisa, love the flourishes behind it! It's been fun being on the team with you, I'll still be around for a visit! wow, this is gorgeous!! I thought you had a real leaf on this!! Your coloring is spectacular! Thanks for playing along with us at DRS Designs! What a lovely card, great image and fab colours!! Thanks for joining us a Inky Impressions this week. This is just stunning! 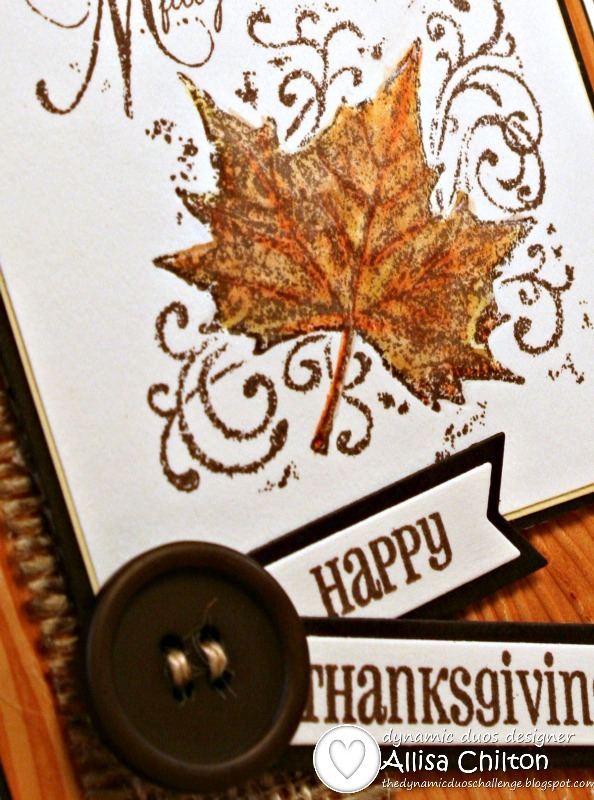 I love the leaf image and burlap panel that makes it perfectly autumn! A gorgeous card, fabulous colours and design, I love the Hessian and the beautiful image. This is gorgeous!! I love that strip of burlap! Thanks for joining us at Wags 'n Whiskers! Such a beautiful fall creation! Love the burlap. LOVE to use it, too. Thanks for joining us at DRS Designs. Great card - love the colours and textures you've used. Gorgeous card and I love the way you used the burlap. Love the way the leaves came out. Totally delightful Allisa! Love all the design elements you used. Been lovely working with you and thank you for your comments on my blog, very much appreciated. Really beautiful fall feeling I get from this card! I love the burlap too! Beautiful card Allisa, such gorgeous colours and I love the stamp. Great layout and beautiful card--love all the details! Thanks for playing along with DRS Designs.